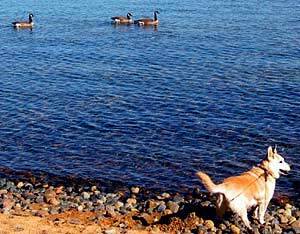 We took our morning walk at Lake Tahoe today. 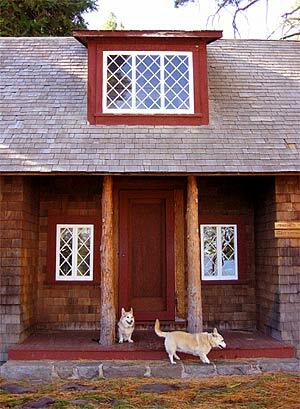 We stopped to rest on the porch of this cabin at the Pope Estates. 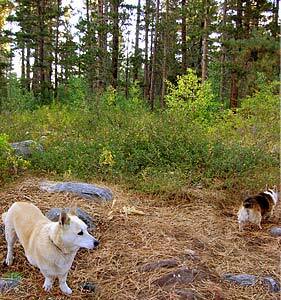 The U.S. Forest Service is kind enough to let dogs—especially Corgis—stroll around here. Look, Daisy! Ducks! Or, geese! Or... Look, Daisy! Waterfowl! 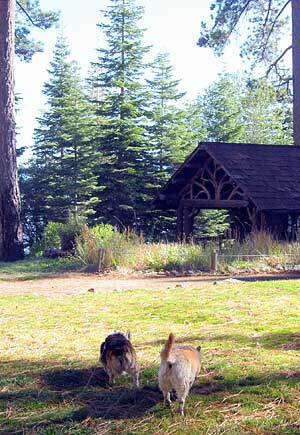 Our folks call this picture “Dog Butts With Scenery.” They think they are funny. Could someone feed me, please? I would be ever so obliged if someone would feed me. I have decided that I do like camping, just in small doses. It was fun and all, but by the fourth day I was ready to go home. Last night, we slept in the tent with our folks. It got quite chilly around 4am, so I sought out a human heat source. Initially, I plopped myself across the first set of ankles I encountered, but that was not a good choice, as ankles don’t generate that much warmth, are not all that comfortable to lie across, and they kept kicking me off. I rummaged around some more until I found a cozy lumbar area, and planted myself there until dawn. I am writing this on vacation (we are camping—again), but you won’t be able to read this until we get back. Our folks let me take a computer, but neglected to arrange for internet access at the tent. Actually, both Daisy and I were quite excited at the prospect of camping. We saw our folks packing things up and were somewhat disappointed when we realized that we wouldn’t be leaving until the next day. We could hardly sleep. We have been doing our usual regimen of near-endless walking. By today at noon, though, I had had my fill for a while, and when our folks tried to take us out for another trek, I went on strike. I just sat my pants down and would not budge. I mean, really, this was after a significant workout on the beach just a couple of hours earlier. I am not certain of the physics, but I believe the resistance factor of sand against legs is exponentially higher when the legs are little short Corgi legs. 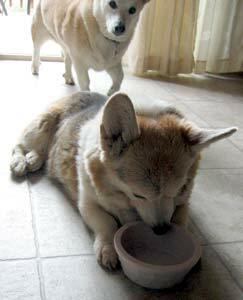 And the resistance factor of a stubborn Corgi who is tired of walking is even higher than that. By this afternoon, however, I was ready for another hike, and that made everyone happy. I just overheard my folks telling someone on the phone that they just got back from taking the two best dogs in the world to the park. Where did they go to pick up the two best dogs in the world? And we just got back from the park, so they must have done that without us knowing about it, so when did that happen? I would be so flattered, but I am too busy feeling silly.